In the first part of my review of Xubuntu I just looked at the default installation. The thing with Xubuntu is that the base is very light but it has so much potential that I believe it can be turned into anything you want it to be. As your needs are different from my needs the ability to customise is very important. Ubuntu is a good operating system. If you are a computer user who is happy to work in a way that the developers have decided is the best way to work and you find the Ubuntu system intuitive and useable then you will have no issues with Ubuntu whatsoever. Ubuntu is very stable, there is a huge software repository and Unity provides all the bells and whistles that you associate with other operating systems. As I said before though it is highly likely that what I think is good others think isn’t so good. For instance I might like a task bar at the top of the screen or I might like it at the bottom. I might like a docking bar, a specific menu system and whizzy effects. I might like my notifications to be displayed in an area of the screen that is non-intrusive. I may also have certain items that I need at a mouse click on the taskbar. I think the default desktop wallpaper provided with Xubuntu is dull. It is too dark and plain. So the first thing I am going to do is change it. To change the desktop wallpaper right click on the main desktop and a menu will appear. On the menu is an item called “Desktop Settings”. Clicking on the “Desktop Settings” icon pulls up the desktop settings application as shown on the left. 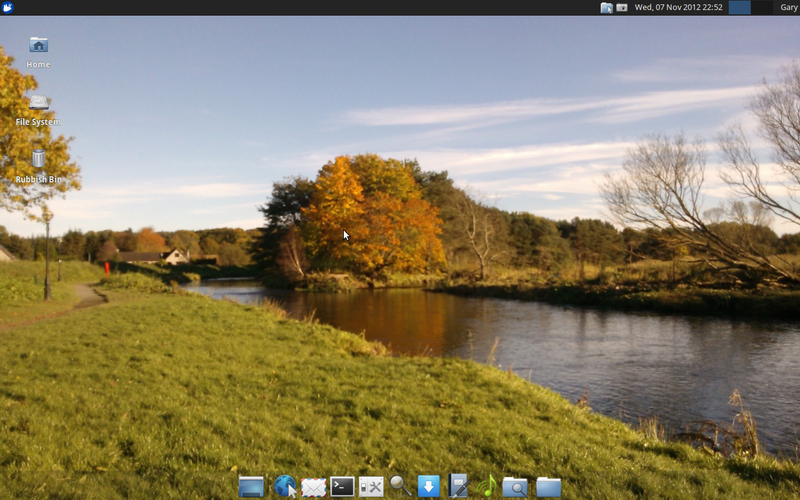 Xubuntu comes with just two wallpapers which are as equally bland. To add your own one either download it from the web or copy it from a camera or USB drive or other device onto your computer. Make sure you are on the background tab and click the green plus (+) symbol underneath the images. This will bring up a file browser and you can find the image you wish to use. The image will now be displayed in the desktop settings window. Click the image to make it the current background. If you are the type of person that likes to have a different image every time you login then you can create a list of images which are then picked from at random. (Perhaps you have 3 children and can’t pick your favourite 🙂 so by having 3 pictures you get a different one randomly each time). To create an image list select “Image List” as the type and then add the list of images you wish to use by using the green plus (+) symbol to locate the files to go in the image list. To test it out click close and log out of Xubuntu and log back in again. If the image is too small to fit the screen you have a number of styles you can choose from. First of all you can centre an image, stretch it, tile it across the screen or zoom in. Finally you can adjust the brightness and saturation by moving the appropriate sliders. 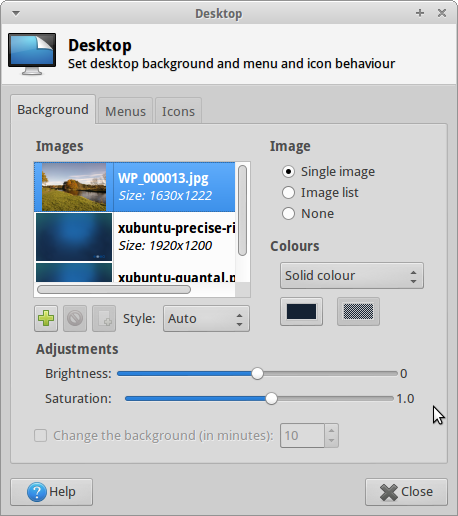 For more hints and tips with regards to changing the desktop background and the use of image lists visit http://www.linuxjournal.com/content/creating-slide-show-backgrounds-xfce. 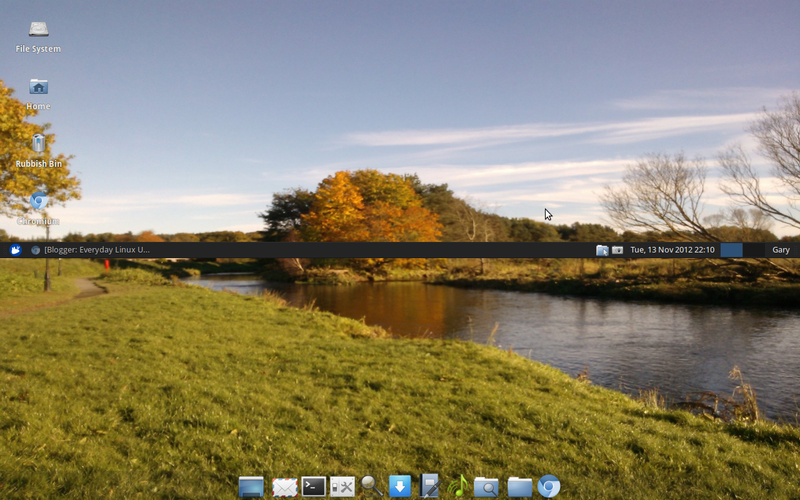 As you can see using by changing the desktop background the Xubuntu operating system looks much more exciting. 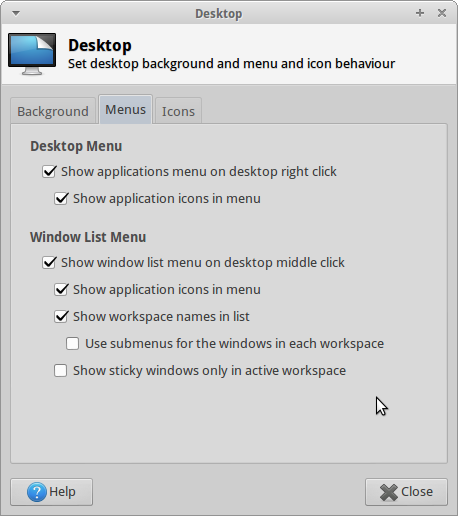 Whilst the desktop settings program is open it is worth discussing some of the other customisations that can be made. If you right click on the desktop then by default there is an option called applications which you can then navigate to find the applications installed on your system. 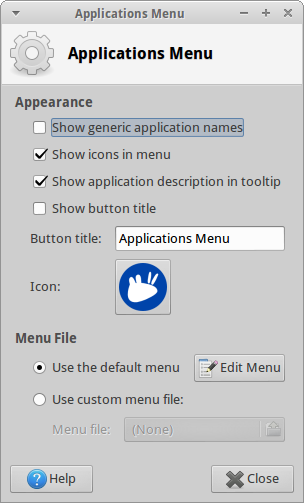 The desktop settings application has a tab called menus which enables you to turn on and off the applications menu on the context menu. As you can see from the image on the left that by default the desktop menu has the applications menu set to visible. You can turn this menu off completely by unchecking the appropriate box. If you prefer to see the menu without the icons (why?) then just uncheck this option. The windows list menu enables you to pull up a list of all windows when you click the middle mouse button (If you have one). 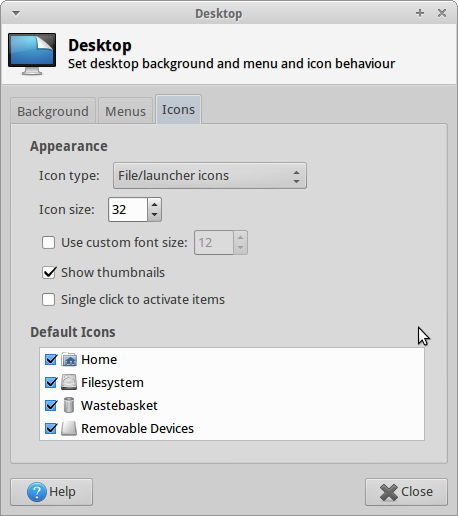 When you first install Xubuntu there are three icons on the desktop (File System, Home Folder and Rubbish Bin). Now this is clearly one area where we will all have our preferences. Personally I like my desktop to be completely uncluttered and so I tend to remove all these icons but other people might think the more icons that are available the more useful it is. I know a guy who uses Windows and has his screen full of icons. Within the “desktop settings” screen there is a tab called “Icons”. Using this tab you can specify the icons that appear on the desktop and how big they are. The icon type enables you to choose which kind of icons you see on the screen. If you choose none then there will be no icons on the desktop at all. If you choose minimised applications icons then you will see an icon for each open application that is currently minimised. The default option is for file/launcher icons. This works similarly to Windows. You can drag files to the desktop and this will create a shortcut to that file. You can also create shortcuts to applications by creating a launcher. There are four icons that are considered default icons and they are “Home”, “Filesystem”, “Wastebasket” and “Removable Devices”. To create a launcher right click on the desktop and choose “Create Launcher”. 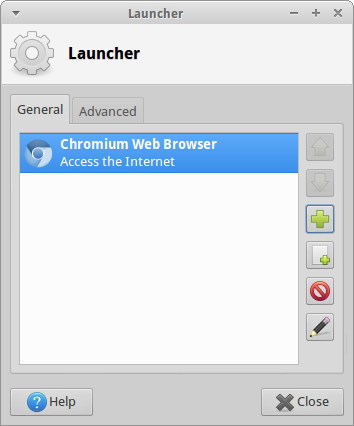 The “Create Launcher” application appears (as shown by the image to the right). Enter the name of the application and find the application to run by clicking the folder icon next to “Command” and then click the application you wish to create a shortcut for. Click the icon button and then find the image you wish to use as a desktop icon. Click “Create” to create the icon. You can change the icon sizes for all the icons on the desktop within the desktop settings screen. Simply change the icon size to the size you want it to be. It is also possible to change the font size for the text underneath the icons by checking use custom font size and then select the font size you wish to use. If you want to see a preview of the file when you hover over an icon check the option called “Show Thumbnails”. Finally by default XFCE is like Windows by default. You have to double click and icon to launch an application. If you prefer you can change it so that a single click launches an application by checking the “Single Click To Activate Icons” option. The panels can be customised to work just the way you want them to. You can change the colour, the icons and the order thereof and where the panels are positioned on the screen. To customise a panel right click on it and select panel -> panel preferences. The Panel application allows you to customise the look and feel. There are three tabs: display, appearance and items. The display tab deals with the positioning and size of the panel. First of all lets deal with the style of the panel. You can choose to either have a horizontal bar or a vertical bar. A horizontal bar is the default option. A vertical bar puts the panel down the left hand side of the screen. (which of course can be moved to the right or vertically down the middle or whereever you choose). The lock panel checkbox locks the panel in place. If you uncheck this option you can position the taskbar anywhere you choose. To show just how customisable XFCE is, here is a screenshot with a panel positioned right across the middle of the screen. The “automatically show and hide” checkbox enables you to show the panel only when the mouse is hovering over it and hide it at all other times. This is useful for perhaps netbooks where screen space is at a premium. The row size option enables you to increase the size of the bar. By default the bar is fairly thin but you can change this to make it more Windows-7-esque. You can also choose the number of rows which I think is just plain weird. You can change the panel width so that it only takes up as much screen space as is truly necessary by changing the length %. If you make it too short you might cut off some of the icons. You can prevent this from happening by checking the “Automatically increase the length” icon. If one panel isn’t enough you can add another panel by clicking the green plus (+) symbol. You can then position this anywhere on the screen you want it to be. Thus far I have looked at the sizing and positioning of a panel. 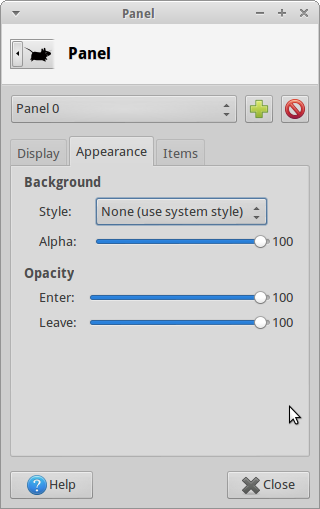 The appearance tab enables you to change how each panel looks within XFCE. 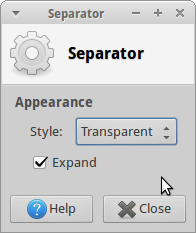 By default Xubuntu comes with 2 panels. The top panel is like a traditional taskbar with 100% width and a solid black background with a menu, icons and clock. The other panel is like a docking bar. The width is much shorter and the panel only contains launcher icons. The background is also transparent. The background style of a panel can either be a solid colour or an image. By default this option is set to none which means you get the system style (which is a black bar). 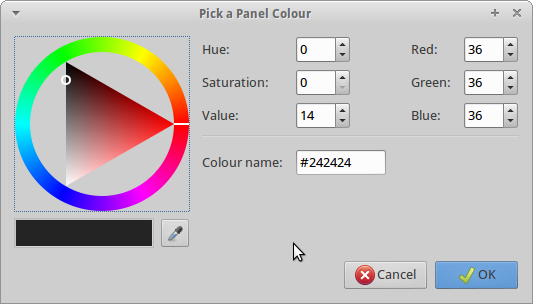 If you choose solid colour then a dialog appears enabling you to choose your colour from a colour wheel or alternatively enter the red, green and blue values or the hex value for a colour. obviously pick and image to use as the background for the panel. The Alpha slider enable you to change the opacity of the bar. This enables you to get a transparent background or a semi-transparent background. The opacity sliders enable you to choose what happens when the mouse hovers over the panel. You can make the panel more or less visible. 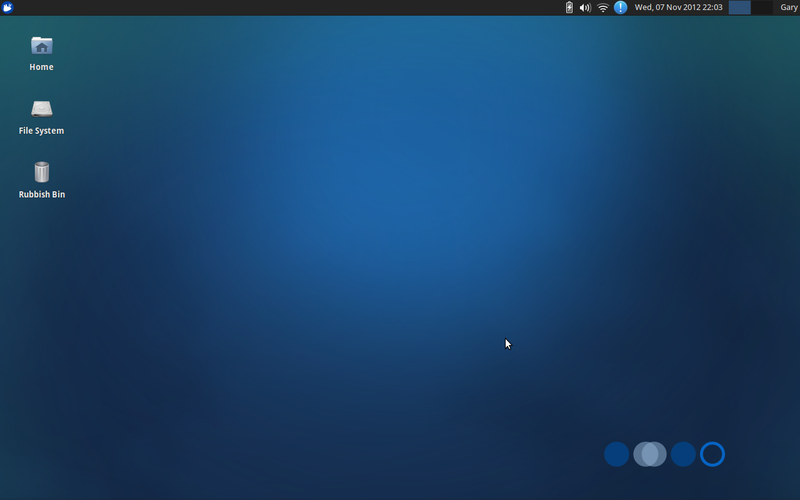 As mentioned before there are two panels within Xubuntu and each behave very differently. You can customise a panel to have the items that you need on them. You can also set the order of the items. The items tab within the panel settings screen enables you to add items to the panel. You can move the items up and down (left and right if horizontal) by clicking the up and down arrow. There are various types of items that can be added including program launchers, action buttons, applications menu, a clock, notifications area etc. One of the more important items is the separator. This enables you to position the other items on the panel. It isn’t very exciting except that if you check the expand checkbox it fills up the rest of the screen (either horizontally or vertically). Therefore if you place a separator in front of say five other items and click the expand checkbox then the five items will be shifted to the right. If you then add a separator on the right and click expand then all the icons will be centred as the separators on the left and right will squeeze all the space leaving just the other items in the centre. This is of course how the bottom panel in Xubuntu gets its look. 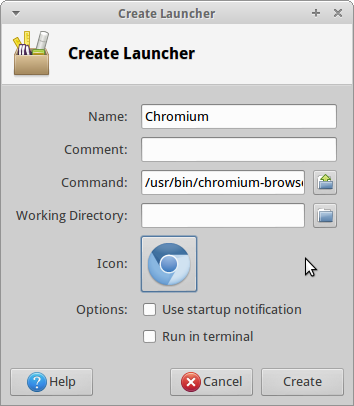 To add an icon that can be clicked to launch an application you need to add a launcher icon. Click the green plus (+) symbol on the items tab and select launcher. The launcher window that opens can then be used to add an icon. Click the green plus (+) symbol and choose the application that you wish to add an icon for. The advanced tab enables you to set tooltips and also whether you’d prefer text as opposed to an icon. If you add multiple programs to the launcher they appear as a menu. The action buttons item determines what happens when you click the username on the panel. The options available include lock screen, switch user, suspend, hibernate, shut down, restart and log out. Another item that can be added to a panel is an applications menu. If you wish to amend one that is already on a panel right click over it and select properties. The show generic application names checkbox determines whether the items on a menu show the physical name of the application (for example Chromium) or whether it shows the type of application (for example web browser). The show icons in menu determines whether icons are shown alongside the menus. If you want to make it obvious where the menu is you can enter the term “Applications Menu” in the button title and then check the “show button title” checkbox. You can also change the icon. You can edit the menu itself by clicking the “edit menu” button. By clicking the “edit menu” button the screen to the right appears. At this point you can choose any submenu and choose which applications appear under that menu. If you want to add a new menu click the new menu option. As you can see XFCE is highly customisable. You can make the desktop work just as you want it to. I have barely touched the surface when it comes to the types of items that can be added to panels. In the next article I will be looking at improving on the applications installed by default with Xubuntu and comparing the top applications for playing music. 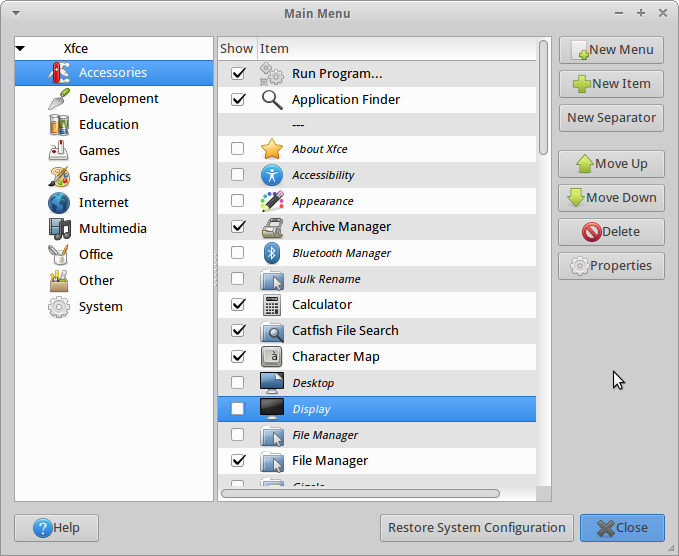 A newer guide has been created showing how to customize the XFCE desktop and includes sections on adding the Whisker Menu and Slingscold dash. Really nice article. Very useful. I am a regular reader of your blog. Keep the good work going. Handy guide. New to Linux I'm playing with Mint 13 XFCE on an older laptop and seems similar. I did have a time and half looking for a GUI to change time zone and ended up using the Terminal for it – a bit crude, unless I missed it somehow. I like your style of review, review and a touch of tutorial thrown in, gives a nice perspective to the review. Helps me as a noob to understand better some of the glitches I may run into on an install. Has made me a regular reader of your blog as well. Thank you, and enjoying my visits. You might want to try editing anything with Alacarte before you explain to everyone what it does, as it is broken. Try deleting some of the categories or separators. Try installing a program like Wine and then moving it's category. Hell, try using any of it's features before you go into explanations of what it does, as it doesn't work at all. You also missed that the Archive Manager is broken. Just try extracting a package. Doesn't work, does it? Not to mention that the notifications icon is missing from 12.10 as well. Frankly, to see core apps like Alacarte and Archive Manager broken and the Ubuntu Notification icon missing all together on a fresh install shows that this release is anything but good. There was just an update released a little while ago that fixes the file roller crash. I agree that was annoying, but its fixed if you install updates! I don't know what it is your talking about Anonymous – I have a notification thing that works – it even has a little icon on the 0 panel. I'm not saying it doesn't work for you (and others) but perhaps its working for some of us? If you look under known issues in the release notes you will see that the messaging indicator is not available for 12.10. Also of note is that Alacarte and Archive Manager are broken for everyone on every Xubuntu 12.10 release. Maybe you should use the distro you are giving a detailed review of? Go and actually try to extract a file or edit the menu. Personally, the problem for me is that you are giving info on what Alacarte does in the bottom of this review. If you had actually used it on this release you would know that it does not work. Frankly, if you are going to give an in depth multi article review of a Linux release, try and actually use the components you are talking about in your review. This way your readers could make an informed decision on if this release is worth installing or not. Or you could continue not actively using the releases you review and letting your users find out on their own that that it is broken and consequently not looking to your site for informative reviews anymore. First of all, I am not the guy who wrote the review. So youre kinda aiming at the wrong guy here. And if it works for me then what did I do to fix it – I honestly have no idea how to recreate it and its sort of weird and interesting to me how. Thirdly, anonymous, as I am not in any way affiliated with this site – I just use my own name (perhaps thats why you assume I have some connection to it) – I cannot influence nor do I have any insight into the work that goes into the reviews. But since I can not see how the writer would gain anything by actively lying to us I can only assume that he has either done some mistake in using the wrong version of it (recreated by me) or that we have both stumbled on some kind of magical fix to these problems. I can honestly say as the reviewer that I have not come across any of the issues mentioned above. I have managed to add and move menu items and Archive Manager is working perfectly well. Maybe this was fixed by an update or an update that I haven't installed yet breaks it. The best thing to do if you have issues with certain parts of any distribution is to contact the developers and log a bug report. You may well find there is a workaround to your issue and it makes the issue visible to the developers. I doubt they have time to spend trawling the comments at the bottom of blog reviews to see if there are any issues that they haven't come across yet. Thank you for nice article, very useful. I see the latest XFCE desktop was seriously improved from previous version. I played with it for a while and must say that I still cannot create layout like I am used from WinXP, layout that is simple and powerful. It is funny that some icons on taskbar in XFCE can have really huge size when you change size of panel; panel in WinXP was smarter, icons had constant size, (you can chose between large and small icons) but when you change size of panel, icons are only rearranged, so more icons will fit on bigger panel in WinXP. 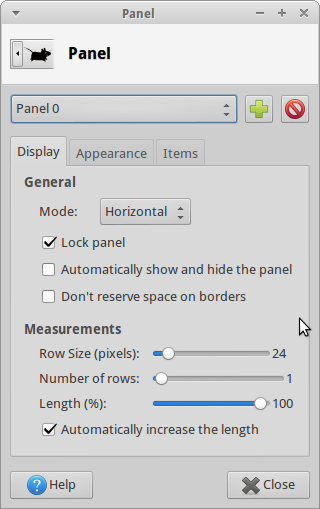 In XFCE, when I change size of panel, some icons grow bigger and just occupy valuable space; for example keyboard layout indicator is nice example of huge icon on my XFCE panel. This is a bit late to comment, but I wanted to point out that you never mentioned the xfce4-goodies package that you can install from the repository. 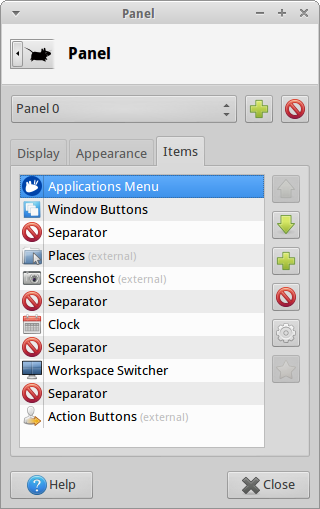 It adds several things to Xfce, particularly additional items to choose from for the panel. I find some of them very nice to have available. If desktop space is limited, some of these can function as substitutes in the panel for things which you might put in a widget on the desktop if you had more room. hey, great blog. one question please. do you know how to configure the panel so that the applications can be drag&drop or sortable? If you're talking about the lower panel, right-click on the thing, hit "move", drag it where you want. For the upper panel I'm pretty sure you have to hit applications-settings-panel. No drag and drop AFAIk. I'm not a power user, and I have no interest in an exciting operating system. The best user interface I've ever known was the Windows 3.1 interface, simply because it was so boring and easy to get around. When I installed Ubuntu 12.10, I thought I was in hell with the Unity desktop. Awful stuff, and not intuitive to me in the slightest. It was my first experience with Linux, and while it was easy to install, it was also not at all what I was looking for. I want an operating system that requires no effort, no maintenance, no knowledge to install, and just works. When I installed Xubuntu 12.10, I found exactly what I was looking for. Though I'm not a big fan of the dock at the bottom of the desktop, it was easy to get rid of. I replaced the background with a flat grey color and left the icons in their boring form. For me, Xubuntu was what I wanted. It sounds like the configuration is flexible enough that just about anybody can make it into what they want, not just a boring old guy like me. I liked the review, and might have to rethink my minimalism sometime. I'm kind of a noob here, but will this work for 12.04? I think I'll get the long term release, it sounds better. Absolutely. There isn't a great deal of difference between 12.04 and 12.10. I came here looking for a solution to restore the dock panel. I stayed to add, tune and generally make my xubuntu installation better. Thank you very much. I join others in saying yours is a refreshingly easy blog to read and use. I came to xubuntu late. I am likely to stay a bit longer, thanks to you. Warm regards from Accra. WHERE did you get that wicked wallpaper????? I love it. The advanced tab enables you to set tooltips and also whether you'd prefer text as opposed to an icon. Great article on XFCE customization. Up until now, I have been using Plank, and didn't realize I could use the panel as such. Great idea. Question: since i can make it my own,literally! can i rename the trash bin to "El trasho",or "The Crapper." or something? and thank you for reviewing what i feel is the best OS in the world.